Blog Kiosk: 6/4/2016 - Dodgers Links - Seager! Seager! Seager! 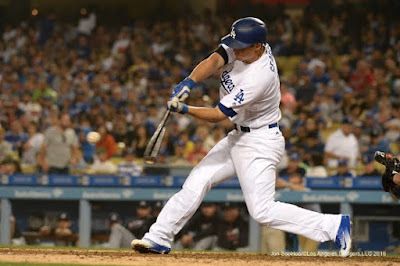 His homers marks the first time a Dodger rookie has hit three dingers in one game since Don Demeter in 1959. This Day in Dodgers History: In 1964 Sandy Koufax would throw his third career no-hitter against the Phillies. In 1968 Don Drysdale threw his sixth consecutive shutout of the season. His scoreless streak was extended to 54 innings. This is also the day Robert Kennedy made note of Drysdale's efforts in a speech at the Ambassador Hotel after winning the CA primary. Soon thereafter, he would be assassinated. In 1972 the Dodgers retired Roy Campanella's number - #39. In 1998 the Dodgers traded Hideo Nomo to the Mets for Dave Mlicki and Greg McMichael. Ugh!